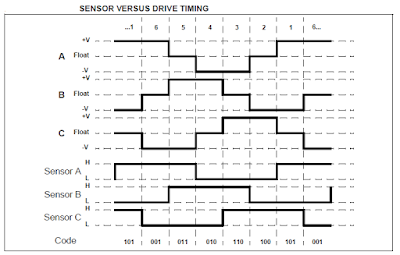 In this blog there are some topics shows how to drive a cd-rom (dvd-rom) spindle motor using different types of PIC microcontrollers. This topic shows how to control the speed of a sensored BLDC motor using PIC16F887 microcontroller. The BLDC motor is a three phase DC motor without brushes. Basically there are two types of BLDC motors: sensored and sensorless. The sensored BLDC motor has 3 hall effect sensors which detect the rotor position while the sensorless BLDC motor has no hall effect sensors and it uses back emf to detect the rotor position. The sensored BLDC motor is easy to drive because always we know the position of its rotor with the help of the hall effect sensors. As mentioned above, the BLDC motor is a 3 phase DC motor which means it has 3 winding on the stator core. 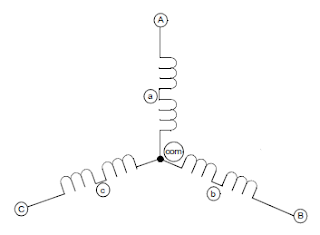 Two windings are excited at a time to create a rotating electric field. This method is fairly easy to implement, but to prevent the permanent magnet rotor from getting locked with the stator, the excitation on the stator must be sequenced in a specific manner while knowing the exact position of the rotor magnets. 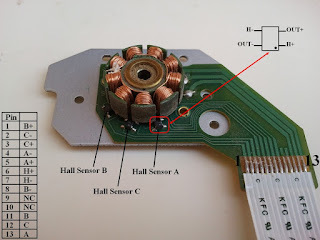 The sensored BLDC motor has 3 hall effect sensors (Sensor A, Sensor B and Sensor C) to sense rotor position, this sensors are placed as shown in the following picture. The motor which I'm going to drive has pinout as shown below (other motors may have another pinout). In this motor each hall effect sensor has 4 pins: VCC, GND and two outputs (some sensors come with 3 pins: VCC, GND and output). The two gates AND1 and AND2 are used to create two PWM signals from single PWM signal because PIC16F887 microcontroller has only two PWM modules and our project needs 3. The other AND gates (AND3 - 8) and the NOT gates are used to drive the bridge mosfets and also provides a good protection to our mosfets because high and low mosfets of one line must not be ON at the same time. A 10K ohm potentiometer is used to control the speed of the BLDC motor where its output is connected to AN0. A 20MHZ crystal oscillator is used and MCLR pin function is disabled. The following is code is for CCS PIC C compiler. The potentiometer is used to change the duty cycle of the PWM signal which causes the speed of the BLDC motor to change. Finally the following video shows a simple hardware circuit of the project. This is an example for connecting the ST7735 1.8" color TFT display with PIC16F887 microcontroller. 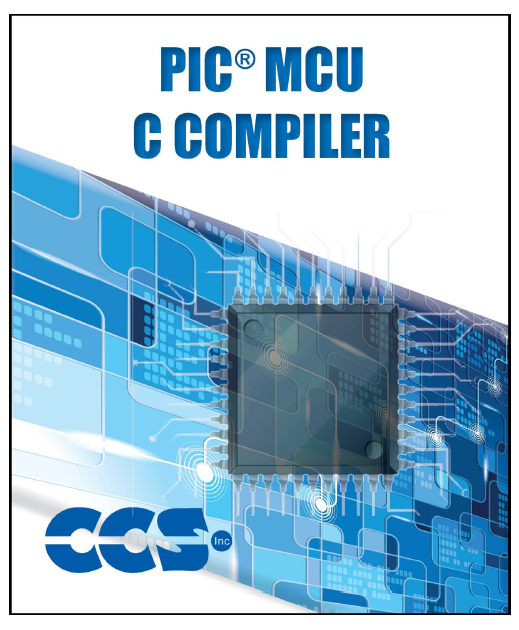 The compiler used in this project is CCS PIC C compiler. After downloading the driver file just put it on the project folder. 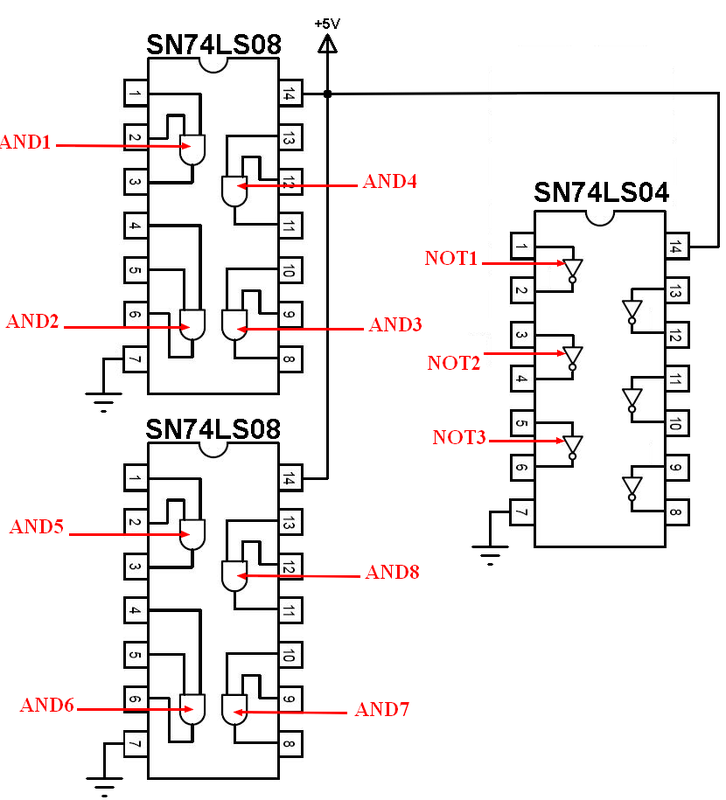 The ST7735 uses SPI communication protocol and the PIC16F887 has one SPI module. Generally the SPI protocol uses 3 lines: SCK (serial clock), SDI (serial data in) and SDO (serial data out) but for interfacing the ST7735 TFT we use only 2 lines: SCK and SDO. 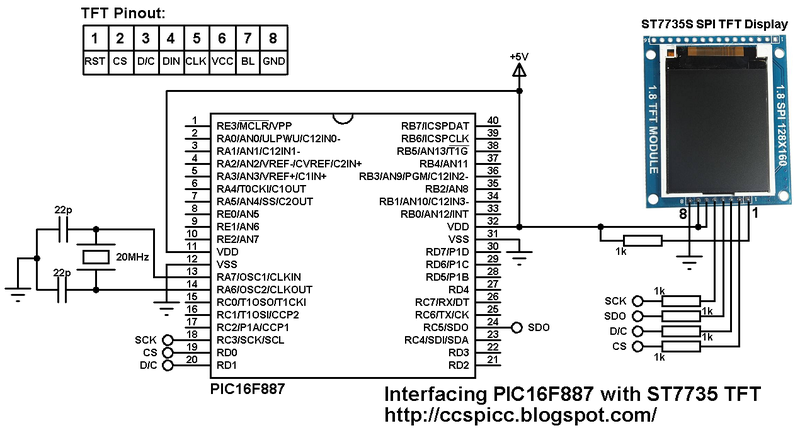 The PIC16F887 has one SPI module with SCK mapped to RC3 pin (#18) and SDO mapped to RC5 (#24). Example circuit diagram is shown below. TFT pin-out are shown in the circuit diagram above. In this project I used 20MHz crystal oscillator which is the PIC16F887 maximum speed for highest SPI data transfer rate (5Mbit/s). Lower crystal frequencies can be used or even the internal oscillator of the microcontroller. 5 x 1K ohm resistors are needed because basically the ST7735 works with 3.3V and the PIC16F887 works with 5V , it may be damaged if it connected directly to the microcontroller. The TFT is supplied with +5V because its board contains AMS1117 3.3V voltage regulator. The code has been tested with CCS PIC C compiler version 5.051. 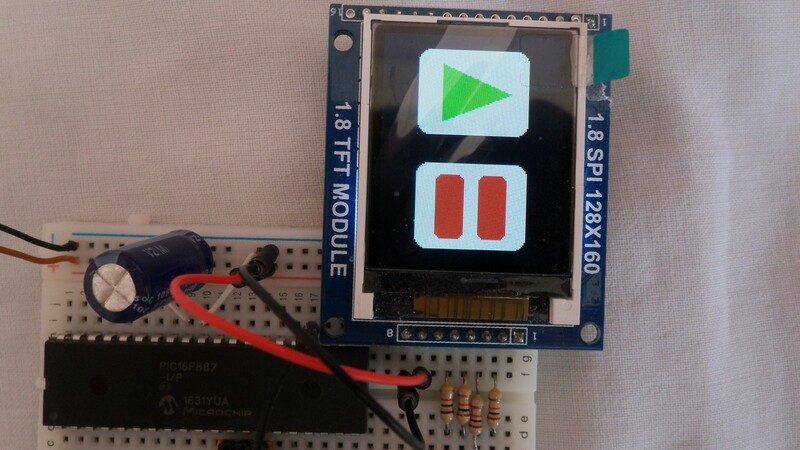 ST7735 TFT driver is needed to compile the code. 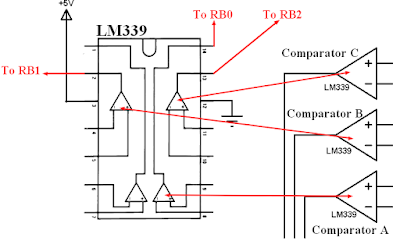 As shown in the circuit diagram the IR receiver output is connected to RB0 pin which is external interrupt pin of the PIC16F887 microcontroller. 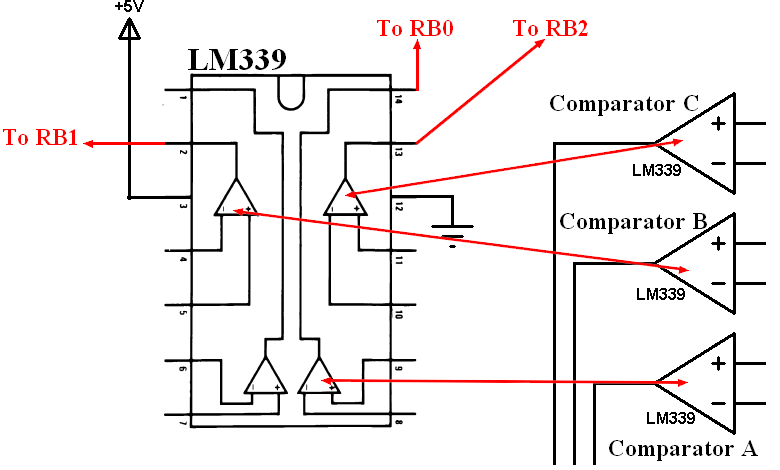 The L293D IC is used to drive both motors in the two directions, the speed of the two motors is controlled the two PWM signals which come from the microcontroller. PWM1 controls motor 1 speed and PWM2 controls motor 2 speed. Motor 1 direction is controlled with IN1 and IN2 pins of the L293D, these pins are connected to RD0 and RD1 of the PIC16F887. Motor 2 is controlled with pin IN3 and IN4 of the L293D, IN3 is connected to RD2 and IN4 is connected to RD3 of the microcontroller. When IN1 = IN2 = 0, motor 1 stops, when IN1 = 1 and IN2 = 0 motor 1 moves in the first direction, when IN1 = 0 and IN2 = 1 motor 1 moves in the second direction. The same thing for motor 2 with pins IN3 and IN4. The 10K ohm resistor is used to minimize the IR receiver output noise. In the circuit there are two voltage sources, one with 5V which supplies most of the circuit and the other one with 12V which supplies only the L293D IC. The 12V source depends on the motors nominal voltage. 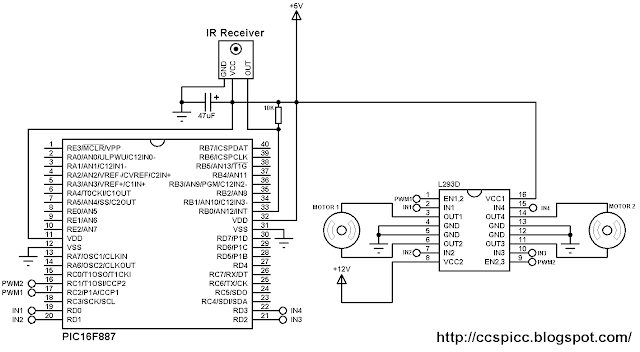 In this project the PIC16F887 uses its internal oscillator and MCLR pin function is disabled. Project C code is as shown below. It has been tested with CCS PIC C compiler version 5.051. But Timer1 module will not start until the microcontroller receives an interrupt on pin RB0 (interrupt edge from high to low). The motor speed changes whenever the duty cycle of the PWM signal changes, and thus if the microcontroller receives speed up button code it will increment the duty cycle, then motor speed will be increased, and if the microcontroller receives speed down button code, the duty cycle will be decreased which causes the motor to decrease its speed. At start up , both motors are stopped because all PORTD pins are zeroes with the command output_d(0); and when start/toggle direction button is pressed, the motor will start (if there is sufficient duty cycle otherwise the duty cycle have to be increased), and the same button pressed again the motor will change its direction of rotation. The full C code is shown below. The datasheet of DS3231 RTC (real time clock) says that it is a low-cost, extremely accurate I2C real-time clock (RTC) with an integrated temperature compensated crystal oscillator (TCXO) and crystal. The DS3231 is much better than the DS1307 which means that it is a very good choice for persons who sell real time clock products. The DS3231 RTC comes with an internal oscillator which means there is no need for a 32.768KHz crystal oscillator. This topic shows the interfacing of the DS3231 RTC with PIC16F887 microcontroller with full adjustment of time and date parameters. Like the DS1307, the DS3231 uses I2C protocol which uses two lines SCL and SDA. The PIC16F887 has a hardware I2C module where the SCL and SDA pins are mapped to RC3 and RC4 respectively. 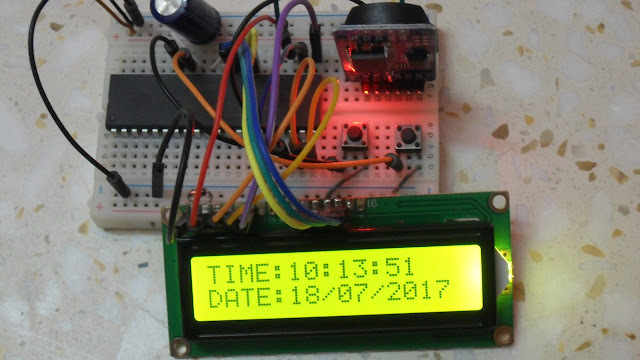 As we can see in the circuit there is a 16x2 LCD to display time and date, this LCD is connected to PORTD. The SCL and SDA pins of the DS3231 are connected to SCL (RC3) and SDA (RC4) pins of the PIC16F887 microcontroller. Two pull-up resistors of 10K are needed for the SCL and SDA lines, if these two resistors are not connected to whole circuit will not work at all and the LCD may not display any thing. The two buttons which are connected to pins RB0 and RB1, these buttons are used to set the time as well as the date as shown in the videos below. The 3V cell battery is used as a backup to keep time and date running in case of main power failure. The circuit can work without this battery but its pin (#14) has to be grounded. The internal oscillator of the PIC16F887 is used and MCLR pin function is disabled. The C code below is for CCS PIC C compiler (tested with version 5.051). Please read the DS3231 datasheet to understand the code. The full code is as the one below. 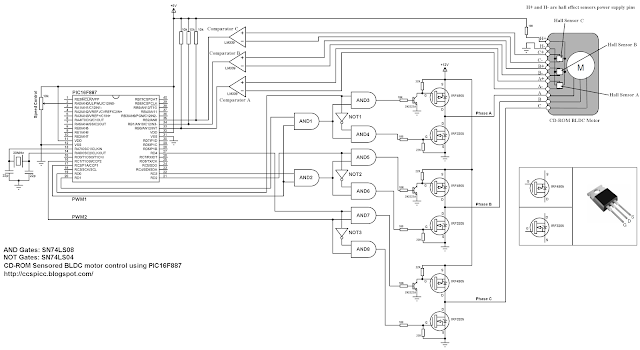 Read DS3231 RTC datasheet to understand the code! The L293D quadruple half-H drivers chip allows us to drive 2 motors in both directions, and with the two PWM modules on the PIC16F887 microcontroller we can easily control the rotation speed of the two motors. (PWM: Pulse Width Modulation). 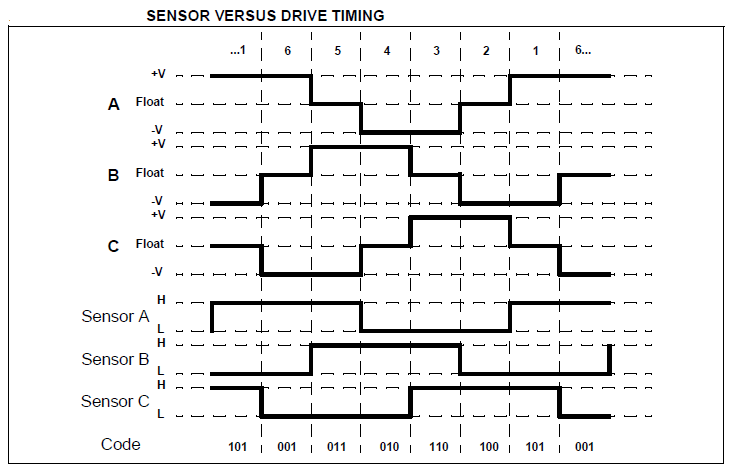 This small example shows how to implement a control circuit which controls speed and direction of rotation using PIC16F887 microcontroller and L293D IC. The microcontroller PIC16F887 has one ECCP (Enhanced Capture/Compare/PWM) module and one CCP module. The two modules can be configured as PWM modules to generate two independent PWM signals (always with the same frequency). The speed of each motor can be controlled with the variation of the duty cycle of the PWM signal. The output pins of PWM1 and PWM2 are RC2 and RC1 respectively. In the circuit there are two potentiometers POT1 and POT2 which are used to control the speed as well as the direction of rotation of motor 1 and motor 2 respectively. POT1 is connected to analog channel 0 (AN0) and POT2 is connected to analog channel 1 (AN1). PWM1 pin (RC2) is connected to EN1,2 pin (#1) and PWM2 pin (RC1) is connected to EN2,3 pin (#9) of the L293D. The other L293D pins which are IN1, IN2, IN3 and IN4 are connected to RD0, RD1, RD2 and RD3 respectively. Motor 1 rotation speed is controlled by PWM1 and its direction of rotation is controlled by pins IN1 and IN2. If IN1 and IN2 are zeroes the motor stops, if IN1 = 1 and IN2 = 0 the motor rotates in the one direction, if IN1 = 0 and IN2 = 1 the motor rotates in the other direction. The same thing for motor 2 with pins PWM2, IN3 and IN4. In the circuit there are two power supply sources, 5V and 12V. The 5V supplies most of the circuit including the microcontroller whereas the 12V supplies one pin of the L293D (VCC2). The 12V power supply source depends on the motor nominal voltage, for example if the motor voltage is 5V, VCC2 pin should be connected to +5V source. In this example PIC16F887 uses its internal oscillator and MCLR pin function is disabled. In this example we've two potentiometers POT1 and POT2 connected to AN0 and AN1. Each potentiometer controls speed and rotation direction of one motor. In the code there are three intervals after reading and saving the analog value. The first interval is [ 0, 500 [ which controls the motor speed in the first direction where the maximum speed is when the analog value = 0. The second interval is [ 500, 523 ], here the motor stops. The last interval is ] 523, 1023] where the motor speed is controlled in the other direction and the maximum speed when the analog value = 1023. 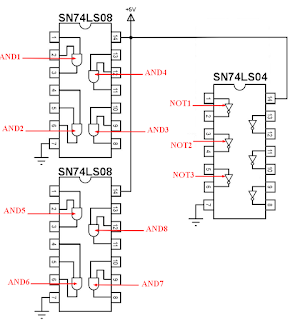 10-Bit ADC resolution is used.